So much of the material upon which 1WD was built consists, essentially, of opinion pieces (in fact, four or five years ago I sat on a panel focused specifically on opinion writing alongside Lettie Teague and Jon Bonne, about which I imagine both of whom are still scratching their heads). But over the years, I’ve tempered (well… by my standards, anyway) the opinion-heavy pieces here in favor of conclusions that can be drawn from data. The older that I get, the more I want to see opinion bolstered by something other than the biased, fallible memories of people’s experiences (including my own). Which is why I get royally pissed at the the wine world’s penchant for defaulting to the data-devoid opinions of entrenched personalities, particularly when it comes to denying the return on investment (ROI from here on out) of wine online (usually with the concept of social media directly in the cross-hairs). While it seems common sense that their must be at least some ROI for wine brands in talking directly with their consumers (which is part and parcel of what social media online can catalyze), remember that data trump opinions, even when those opinions align perfectly with common sense. 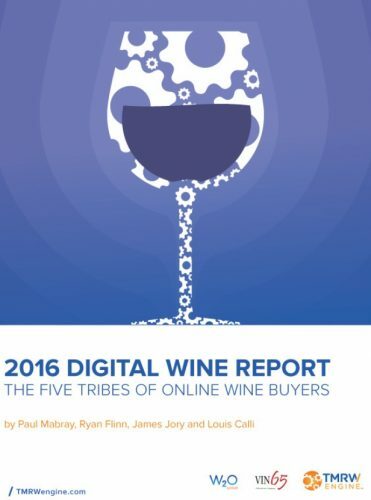 The data come to us via the 2016 Digital Wine Report, an effort by TMRW Engine (a sort of successor to Vintank), Vin65, Wine Direct, and W2O Group. I’ve been given access to the full report, and there’s too much great information in it to distill into a single blog post (even one as long as I’m apt to write). However, we can focus on the mic-dropping, money-shot ROI portion, which is a manageable load (see what I did there?… sorry…). Good so far? Ok, let’s talk about the why for a second. Ok, more like for a minute. Or three. If you want to get noticed in that level of competitive mess, you either need a billion-dollar marketing budget, or you’d better be good at guerilla marketing. Actually, one could argue (god knows that I have) that guerilla marketing is one of the only viable tactics available to small wine brands, and the use of social media is, essentially, guerilla marketing. 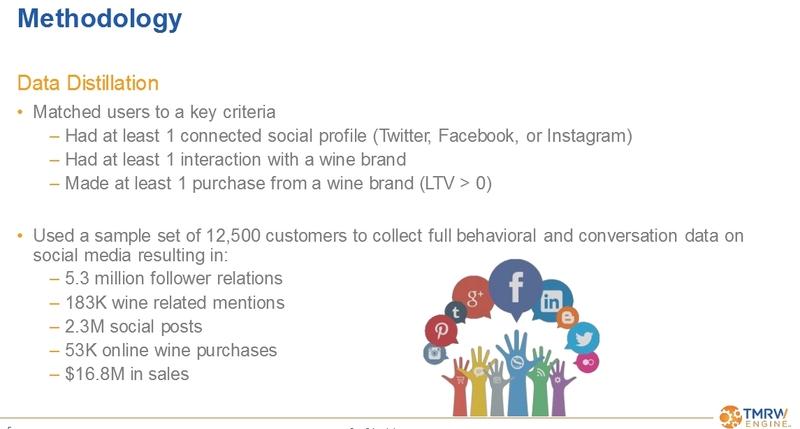 Put another way, if you do social right when it comes to wine, you do, in fact, sell more wine. 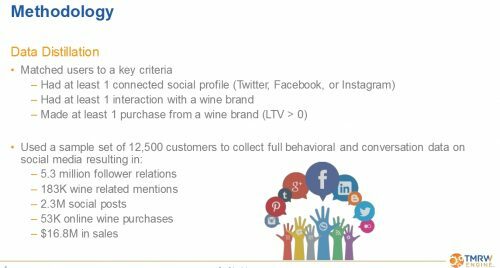 Customers who engage with wine brands on social media even in amounts as small as ONE interaction can see that customer uptick their sales. 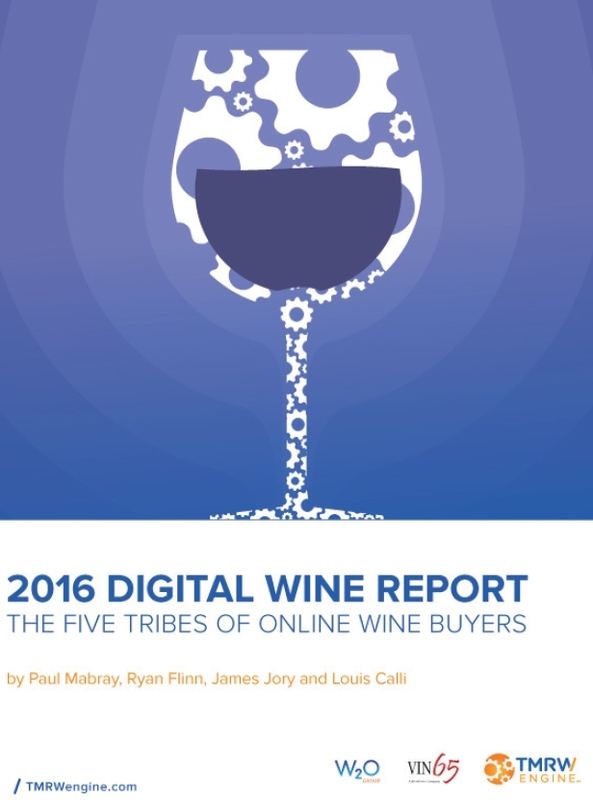 But the bottom line – and it’s an exciting one, especially for smaller brands – is that engaged online wine customers spend more money on wine. I repeat: THEY SPEND MORE F*CKING MONEY and the spend it BUYING F*CKING WINE. I suppose that the lesson here is that any wine brand that doesn’t want to see an uptick in spending for the general online wine-buying populace should remain dismissive when it comes to the ROI potential of social outreach. Have fun with that, guys. Joe, did the report address the sequencing of events (1. not a customer, 2. engage online, 3. become a customer)? The correlation between customer status and engagement isn’t controversial. You buy wine from a winery, they send you emails, you click on the follow us on twitter link and now there’s at least some chance of social engagement. People are more likely to engage with entities they have pre-existing relationships with. It’s not. The report concludes a link, with further details on the dollar values and segmenting the customer types. I recommend that you read the deck and report summaries, and contact them if you want to the full report. 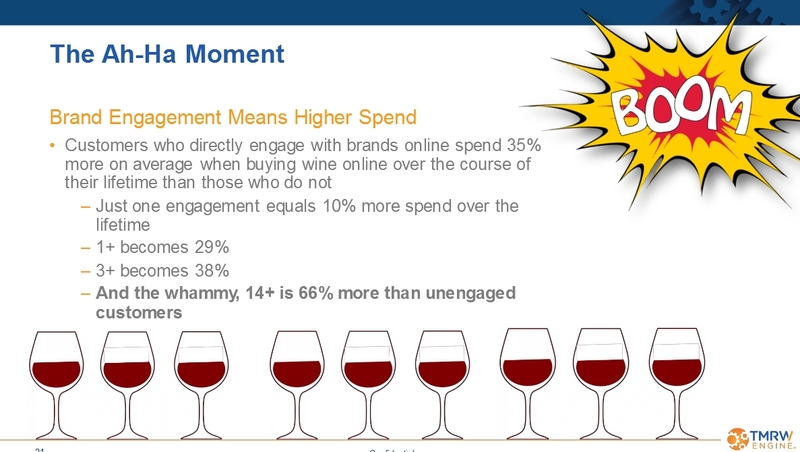 My understanding is that the report is not about customer acquisition, it’s about detailing customer types and correlating online engagement with increased online spending on wine, the latter of which has not really been done before *based on viable data* (which is why, IMO, the report is important). But you (and, to be fair, others) make it very clear in your post that this is validation of the ROI of social marketing investment. Invest in social marketing and sales will follow. But that’s not what this report says. It simply says that customers engage with companies more than non-customers do. I don’t think there’s a person on the planet who doesn’t believe that… so what’s with the dropping the mic bit? 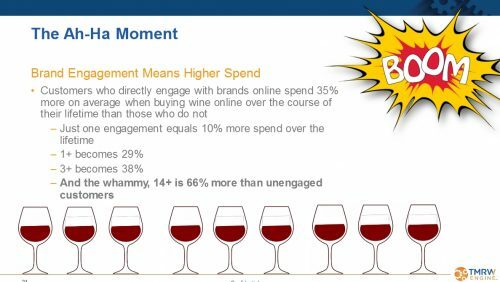 The conclusion as I see it, based on data (that’s the important aspect, remember), is that a) engaged online wine customers buy more wine (as you noted), and b) there is opportunity for wine brands to engage customers online and potentially get them to spend more money. To the best of my knowledge, this has never been confirmed with such a rich data set before. It does, therefore, significantly undermine what is, in my view, a somewhat prevalent opinion that online and wine don’t really garner any sales benefits. Sorry, forgot to add that the dropping the mic term was used by the authors, I’ve reached out to Paul to see if he can provide more detail here (I don’t want to misrepresent their findings, and I’m not sure how much of the final, complete report I am allowed to share yet). Hi Michael – thanks for your interest in the report methodology. My name is Meredith and I’m a member of the data analytics team who worked on the report. To clarify your point above, this report focused specifically on wine customers, and did not include analysis of non-wine customers. The purpose was not to prove causation, but instead to demonstrate the value of brand engagement with customers. We did this by comparing the lifetime customer value per order for customers who had engaged with a wine brand on social vs. customers who had not engaged with a wine brand on social. What we found was that customers who engage with the brand on social spend 35% more than customers who did not engage with a brand. So in summary, these findings may or may not extend to new customer acquisition, but are absolutely relevant for opportunities convert your existing customers to be high value customers. Let us know if you have any other questions – happy to address. Hey Meredith. Thanks for the info. On one hand, I have no doubt that outbound communication to customers increases sales – regardless of channel. It’s very easy to test this with email because there is clear sequencing (I send out email; 15 minutes later I get an order from an email recipient). You could do that with social as well, but AFAIK, the report didn’t look for a causal relationship (engagement -> sales). Is it possible that it’s the other way around (sales -> engagement)? That is, since I am already a big customer of winery X, I tend to be more interested in engaging with them. Michael, Paul here. We actually examined that and found the causality from social engagement, not the other way around. Another post I am late to the game on. There are in excess of 8,500 wineries in the United States. The vast majority are small family businesses. These folks are farmers, not marketers. They rise before dawn to tend their vineyards, and work well past when the sun sets. How many of these farmers have the time or the alacrity to use social media to engage 1:1 with current [retention efforts] and prospective [acquisition efforts] customers? I don’t know, but 100% of them are already involved in the production of a product that is seeing its most competitive market ever. So the ones who are able to carve out time for engagement are probably going to have brands that outlive those who aren’t. First, thanks you for answering. Secondly, I think your characterization of the majority of 8,500 wineries being small farmers is more romantic than true. We see more gentlemen farmers than “folks” that are farmers. But regardless, what is 100% true, is that all of these wineries have the ability to answer their phone, their email, their mail, etc to talk to a customer. Why don’t they answer the (not so) new phone called social media? Prior to this it was because everyone pointed to the lack of proof for ROI. That conversation is now antiquated by the irrefutable proof in the 5 Tribes report. I hope this helps ALL wineries realize that we don’t choose where to speak with our customers, they do. And there is ALWAYS ROI when talking with your customer.